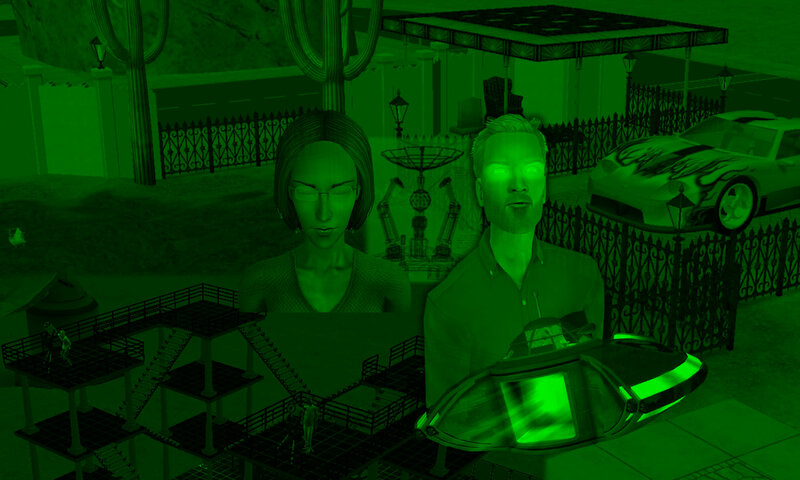 The STSYC authors’ interpretation of the Sims 2 StrangeTown families’ timelines, and a closer examination of the age discrepancy of Lola and Chloe Curious-Smith (Singles). The Specter/Nigmos/Muenda family timeline will be examined in detail in [Olive Specter’s Timeline]. “-45” means “45 years before the start of STSYC”. The authors are aware that the Curious siblings, especially the brothers, are sometimes depicted to be closer in age. 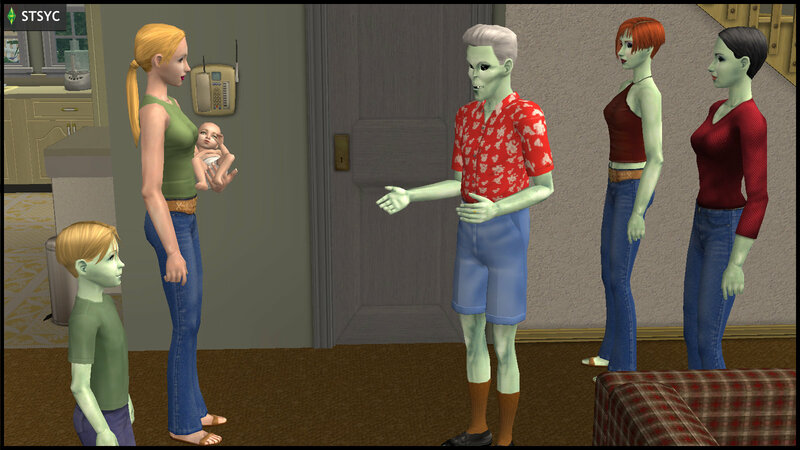 But we had a a different impression, based on each sibling’s starting “number of sim days before aging to elder”, which are: Jenny (5), Pascal (19), Vidcund (23) and Lazlo (28). So we decided to spread out their ages over the two realistic decades of their mother’s possible childbearing years. Jenny Smith was not the only member of the Curious family who had children with Pollination Technician #9 Smith. 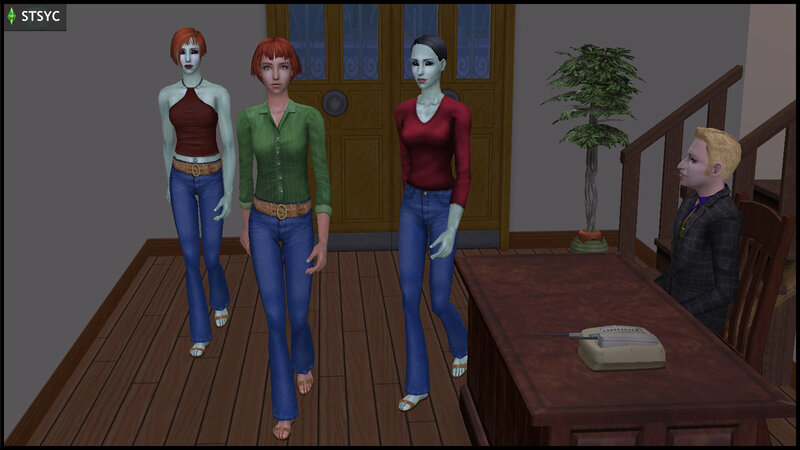 Years before Jenny was even born, young PT9 abducted Glarn Curious, and impregnated him with alien twins Lola and Chloe. 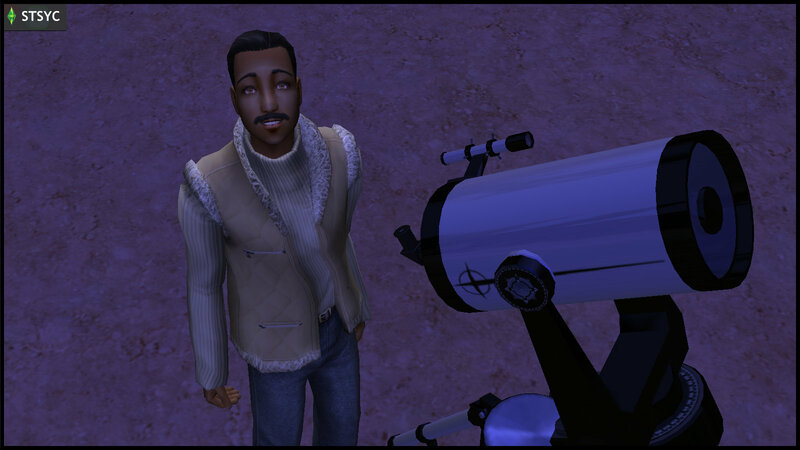 At that time, Glarn was married to Glabe Curious. He abandoned Lola and Chloe with Glabe, and walked out of their lives completely. Soon after, he and Glabe divorced. Glarn married Kitty Curious, who would become the mother of Jenny, Pascal, Vidcund and Lazlo Curious. So Glabe Curious raised Lola and Chloe as her own daughters. 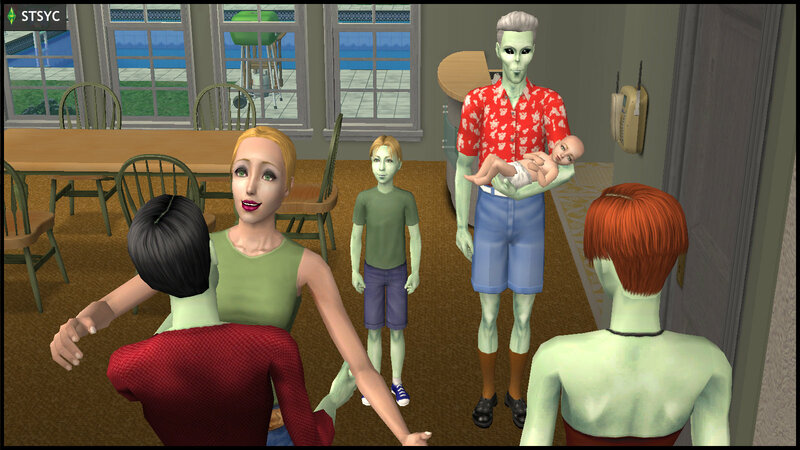 In response to the girls’ questions about their paternity, Glabe could only confirm that Glarn did NOT have green skin, and that an “unknown alien” had been responsible for impregnating Glarn. So Lola and Chloe grew up estranged from their father Glarn, and had no contact with his new family. By the time the girls were 18, Glabe had run into financial trouble, having made the mistake of borrowing money from the loanshark, Crime Spree Bob(*). Glabe happened to know the “Ratticator”(*), a disguised vigilante who revealed themself to be the owner of a hotel one mile outside StrangeTown. The Ratticator offered to shelter Glabe and her daughters, while Crime Spree Bob was dealt with. However, when Glabe, Lola and Chloe checked in to the hotel, the Ratticator had mysteriously vanished. With her promise of protection gone, Glabe tried to gather Lola and Chloe to flee StrangeTown, but the girls were also nowhere to be found. After a futile search, Glabe concluded that the Ratticator had betrayed her and kidnapped the girls, so she fled StrangeTown alone in despair. While the Ratticator did not kidnap Lola and Chloe, the Ratticator was indeed partially responsible for their disappearance. In truth, Lola and Chloe had been wandering around the hotel, and stumbled into a magical secret room that contained the “Bovine Shrine”(*). The door vanished behind them, leaving the girls subsisting on the Bovine Elixir for what they believed was 34 days, since Lola drew a line on the wall for what she interpreted to be the passing of each day. However, Lola and Chloe were really in that room for 34 years, but they still retained their youthful 18-year-old bodies. 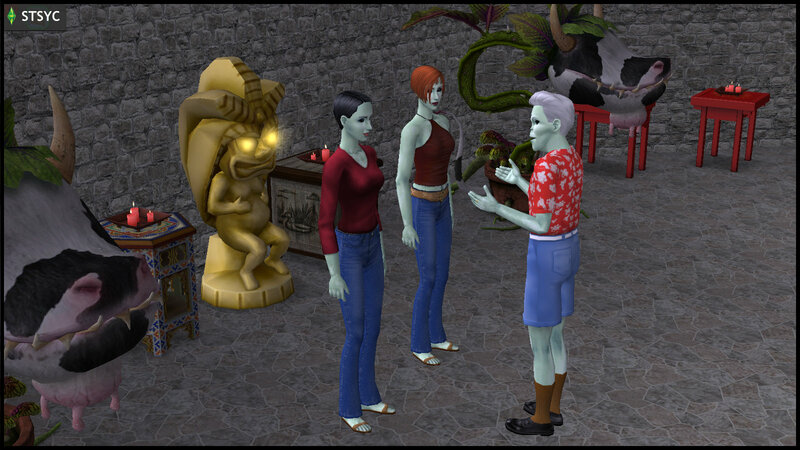 By the time the door reappeared, there stood an elderly alien, PT9, who acknowledged them as his daughters. PT9 updated the girls about the deaths of both Glabe and Glarn, hence the fact that he was their only living parent left. When the girls hoped that they would finally be able to live with one of their biological fathers at last, PT9 had to crush their hopes by informing them that he already had another family, complete with a wife and two young children. PT9 promised to introduce Lola and Chloe as his distant nieces, and they were to call him “uncle”, until he worked up the courage to tell Jenny the truth. He finally did, within a month. Jenny reasoned that Lola and Chloe “happened” long before she was even old enough to get married, and that PT9 was only “doing his job” at that time. She was pleased to hear the truth directly from PT9, and accepted Lola and Chloe as part of their extended family. Meanwhile Lola and Chloe moved into their own house. To help with the bills, they welcomed fellow Singles Erin Beaker and Kristen Loste into their household. (*) References to the Nintendo DS version of Strangetown. Check out the [STSYC Bloopers]. You may also want to try the STSYC Quiz. For the Specter family timeline, see the extended Extra, [Olive Specter’s Timeline].